All birders deal with occasional feeder pests, from mice and squirrels to insects, deer, and raccoons. Bears, on the other hand, are more than pests. Learning how to protect bird feeders from bears is essential to enjoy birds without inviting less enjoyable and potentially dangerous backyard guests to the buffet. Both black bears and grizzly bears will visit bird feeders occasionally. Visits most frequently occur from late winter through early summer when other food sources may be scarce and bears are emerging from hibernation, often with hungry cubs in tow. Bears are omnivorous and eat a wide variety of foods, but the majority of their diet is plant material such as seeds, fruits, and grains, making bird feeders ideal for a quick snack. Bears have a keen sense of smell to detect even small amounts of food, and are persistent in their attempts to break into a feeder, which will damage the feeder and deprive birds of the food. Once a bear discovers a feeder's easy meal, the bear may return over and over again, making it imperative to discourage bears even before they discover bird feeders. Bears are strong, powerful animals with hearty appetites, but even a small bird feeder and the foods it provides can be dangerous. Bears will repeatedly take the easiest meal possible, but frequent meals from bird feeders do not provide adequate nutrition for a healthy diet, particularly for cubs or younger bears. Bears can contract diseases from dirty bird feeders, and those diseases can then be spread to other bears, decimating an entire local population if only one bear frequents feeders. Sharp parts from a broken feeder can injure a bear’s mouth, paws, and eyes, possibly leading to infections, disabilities, and other difficulties. Bears that frequent feeders grow more accustomed to human-occupied areas and are more vulnerable to being hit by cars or accidentally shot. Once a bear is used to eating from feeders, local wildlife officials may be unable to discourage the bear from staying in a residential area, and it may have to be killed if removal is not feasible. To protect bears as well as prevent damage to feeders and loss of birdseed, it is best to take steps to protect bird feeders from bears as much as possible. In areas where bear activity is frequent, it is still possible to discourage bear visits to bird feeders. 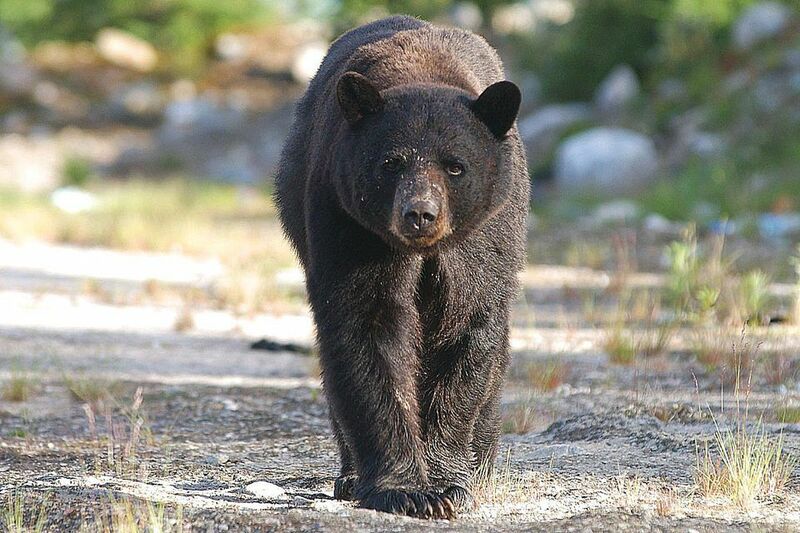 If bears are a consistent problem, it may be best to remove feeders entirely during the spring and summer (from mid-April to late October, though dates vary based on local bear activity). Birds, of course, will find plenty of other natural food sources. Taking feeders in at night can also deter bears, though if there is a lot of spilled seed they may still visit for that snack. Keep bird feeding areas clean by using a yard vacuum to remove spilled seed and hulls, use trays or mesh nets underneath feeders to catch seed, and clean the feeders regularly. Not only will this eliminate the food, but it will also minimize odors that could attract bears. Bears will climb poles to reach feeders or may push or lean on poles to knock feeders down. A sturdy, metal pole with the feeder 10-12 feet high is best to discourage bears, but the pole should be secure enough in the ground that it cannot be knocked over or easily uprooted. Feeders could also be mounted on cables or wires strung between two trees, so long as the feeder is high enough and at least 5-6 feet away from a tree bears could climb. Bears are most attracted to suet and seed feeders, but will also sip at leaking nectar feeders or try feeders where fruit is offered. Instead of offering these treats to birds, offer bitter-tasting safflower seed or Nyjer and plant natural foods instead of feeders. While bears will still investigate many natural sources, especially fruit on berry bushes or fruit trees, they are less likely to linger if feeders aren’t available. The powerful claws and jaws of bears can overcome any bird feeder. Most bears are industrious and will persist after a tempting feeder until they succeed, but less vulnerable feeders may discourage some bears from snacking. Choose feeders made from solid metal or thick, durable recycled plastic. Tube feeders and cage feeders also offer more difficult feeding access for bears. It may not always be the feeders that bears are after. Be sure birdseed is stored properly in airtight, secure containers, and ideally store it indoors in a sturdy, locked garage or shed that bears cannot enter. Bears wandering into yards for birdseed may find other easy foods that tempt them to stay. Remove outdoor pet foods, keep trash secure, tend compost piles properly to eliminate odors, and keep barbecue grills clean so there are no other smells or foods that could lure bears. Adding liberal amounts of red pepper to a birdseed mix can discourage bears that don’t like the hot flavor, though some bears may become used to the taste over time. Sprinkling pepper over the ground or using vinegar or ammonia on the ground around the feeder can also help deter sensitive bears. Setting automatic sprinklers to run during nighttime hours is not only more efficient water use, but powerful sprinklers can also discourage bears. While not a strongly effective method, this can be helpful in conjunction with other methods to keep bears away from bird feeders. Install motion sensor-operated lights of the highest safe wattage aimed at the bird feeders. Bears will trigger the lights when they approach and will not like the disruption to their vision. Most bears will then head for darker areas away from the feeders where they feel more secure. If your property has fences, make them more bear-resistant. Strong metal fences at least six feet tall are best for deterring bears, and gates should be kept securely closed at all times. None of these methods are 100 percent effective on their own and it can be challenging to completely bear-proof a bird feeder. The best way to protect bird feeders from bears is to use several techniques so the bears cannot get an easy meal. The harder the food is to access, the more likely it is the bears will leave feeders alone. If a bear becomes a regular guest at bird feeders, it will become dangerous to itself and to humans and pets. All bear sightings should be reported to the proper authorities, and multiple sightings may result in officials attempting to relocate the bear to a wilder, safer setting. At no time should a birder try to capture, harm, or approach a bear, even with the best intentions. Bears can be more than a nuisance at bird feeders. Not only can they damage or destroy feeders and consume expensive seed quickly, but being at the feeders can endanger the bears and make them more of a danger to humans. By knowing how to make feeders less bear-friendly, it is possible to still enjoy birds without a surprise visit from a much larger hungry guest.